Carrot cakes have been known since ancient times. Different Russian city was famous for sweet products and gave them their names: Tula, Suzdal, Vologda, Moscow gingerbread. Such delicacy can not only produce according to original recipes, and paint by hand. Try to bake their own cakes, then cover them with glaze, make graffiti on them or apply ornaments. 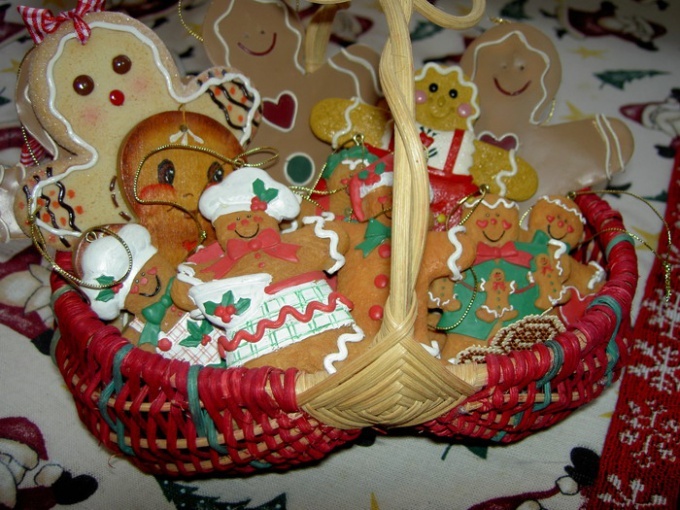 Bake the gingerbread. While they are cooling, prepare the glaze on one of the recipes. The harvesting of carrots for further painting can be bought in companies specialized in cakes. Grind sugar in a coffee grinder or use the finished icing sugar finely. Sift it into a bowl through a sieve, to avoid lumps. Pour in the powder 3 tablespoons water and 3 tablespoons of other liquid. It can be a liqueur, dessert wine, lemon juice. Mash sweet mass with a wooden spoon until smooth. You will have a smooth shiny glaze. Separate the whites and yolks of two eggs. Yolks put in a container with lid and store in the refrigerator. Use them for other dishes. Whites and place in a bowl. Mash the whites with a spoon and gradually add the powdered sugar. Ready-made icing similar in consistency to a thick cream. Pour in the ground a couple of teaspoons of lemon juice and stir well. In a bowl whisk together a protein with starch. Add the powdered sugar and carefully RUB it with a spoon so that the mixture has become smooth. Pour lemon juice evenly stir the glaze until smooth. Divide prepared white frosting into several cups. They need as many as colors you plan to do. Use for coloring or natural food dyes. Add food coloring as directed on the label. Natural dyes can be obtained from juice of fruits or vegetables. Bright Burgundy color will, when introduced into the glaze droplets of beet juice. Other red shades make with cranberry juice, cherries, cranberries. Orange in color white sweet mass will give orange juice or carrots. Adding cocoa powder will get brown. Make a cone out of tracing paper. Fill it with icing needed for color drawing. Cut paper sharp nose. Through him, squeezing Cornett, squeeze a thin stream of icing on the gingerbread. Leave the painted cakes to dry in a warm room, arranging them in a single layer on the tray.